While Cool Hunting warns of disasterous downfalls that can come with precariously placing your laptop in the kitchen, we don't look nearly as geek-chic without it. Thankfully, a student at the University of Applied Sciences identified the dilemma. Offering up a new shiny gadget to replace the old dulling titanium, the 'coo.boo' is a digital cookbook that's too kool for k's. 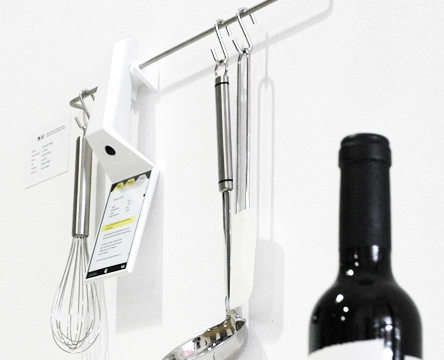 Still in prototype stages, the spatula design syncs up with your computer to deliver recipes with optional audio/visual assistance. Like your other 'precarious devices', the coo.boo aims to be dishwasher safe.